It was a rough fourth quarter for many hedge funds, which were naturally unable to overcome the big dip in the broad market, as the S&P 500 fell by about 4.8% during 2018 and average hedge fund losing about 1%. The Russell 2000, composed of smaller companies, performed even worse, trailing the S&P by more than 6 percentage points, as investors fled less-known quantities for safe havens. This was the case with hedge funds, who we heard were pulling money from the market amid the volatility, which included money from small-cap stocks, which they invest in at a higher rate than other investors. This action contributed to the greater decline in these stocks during the tumultuous period. We will study how this market volatility affected their sentiment towards J.B. Hunt Transport Services, Inc. (NASDAQ:JBHT) during the quarter below. Is J.B. Hunt Transport Services, Inc. (NASDAQ:JBHT) a buy, sell, or hold? Money managers are reducing their bets on the stock. The number of long hedge fund bets decreased by 4 in recent months. 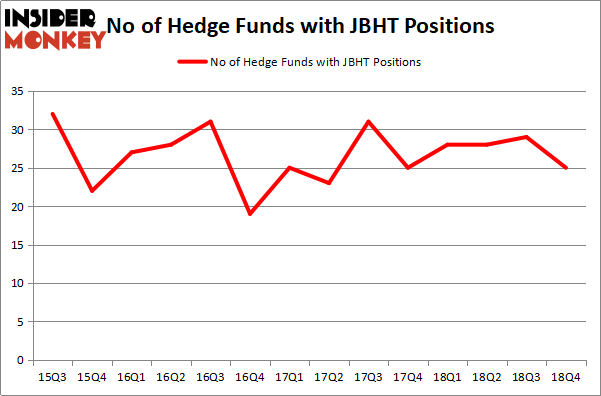 Our calculations also showed that JBHT isn’t among the 30 most popular stocks among hedge funds. If you’d ask most stock holders, hedge funds are perceived as underperforming, old investment vehicles of yesteryear. While there are more than 8000 funds in operation at the moment, We hone in on the moguls of this club, approximately 750 funds. It is estimated that this group of investors watch over bulk of all hedge funds’ total asset base, and by watching their highest performing equity investments, Insider Monkey has come up with various investment strategies that have historically surpassed the broader indices. Insider Monkey’s flagship hedge fund strategy outpaced the S&P 500 index by nearly 5 percentage points per annum since its inception in May 2014 through early November 2018. We were able to generate large returns even by identifying short candidates. Our portfolio of short stocks lost 27.5% since February 2017 (through March 12th) even though the market was up nearly 25% during the same period. We just shared a list of 6 short targets in our latest quarterly update and they are already down an average of 6% in less than a month. We’re going to go over the latest hedge fund action encompassing J.B. Hunt Transport Services, Inc. (NASDAQ:JBHT). How are hedge funds trading J.B. Hunt Transport Services, Inc. (NASDAQ:JBHT)? Heading into the first quarter of 2019, a total of 25 of the hedge funds tracked by Insider Monkey held long positions in this stock, a change of -14% from the previous quarter. By comparison, 28 hedge funds held shares or bullish call options in JBHT a year ago. With the smart money’s capital changing hands, there exists a few noteworthy hedge fund managers who were increasing their holdings substantially (or already accumulated large positions). Among these funds, Renaissance Technologies held the most valuable stake in J.B. Hunt Transport Services, Inc. (NASDAQ:JBHT), which was worth $74.3 million at the end of the third quarter. On the second spot was Two Sigma Advisors which amassed $55.3 million worth of shares. Moreover, Echo Street Capital Management, Park Presidio Capital, and AQR Capital Management were also bullish on J.B. Hunt Transport Services, Inc. (NASDAQ:JBHT), allocating a large percentage of their portfolios to this stock. 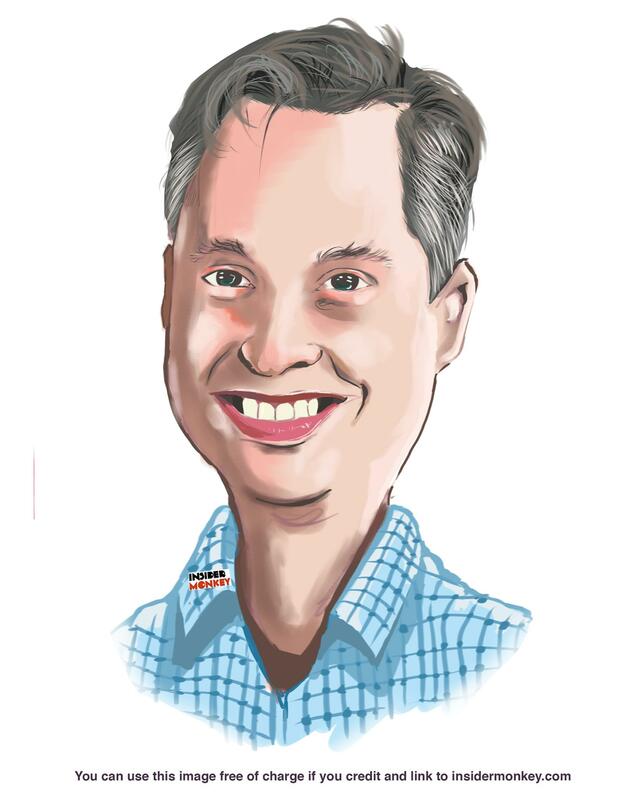 Because J.B. Hunt Transport Services, Inc. (NASDAQ:JBHT) has witnessed a decline in interest from the aggregate hedge fund industry, it’s easy to see that there lies a certain “tier” of money managers that slashed their full holdings in the third quarter. Intriguingly, Peter Rathjens, Bruce Clarke and John Campbell’s Arrowstreet Capital dumped the largest stake of all the hedgies followed by Insider Monkey, worth an estimated $30.9 million in stock. Andrew Sandler’s fund, Sandler Capital Management, also cut its stock, about $18 million worth. These transactions are important to note, as total hedge fund interest dropped by 4 funds in the third quarter. Let’s now take a look at hedge fund activity in other stocks similar to J.B. Hunt Transport Services, Inc. (NASDAQ:JBHT). These stocks are SVB Financial Group (NASDAQ:SIVB), Old Dominion Freight Line (NASDAQ:ODFL), Sociedad Quimica y Minera (NYSE:SQM), and CF Industries Holdings, Inc. (NYSE:CF). This group of stocks’ market valuations resemble JBHT’s market valuation. As you can see these stocks had an average of 25.75 hedge funds with bullish positions and the average amount invested in these stocks was $466 million. That figure was $318 million in JBHT’s case. CF Industries Holdings, Inc. (NYSE:CF) is the most popular stock in this table. On the other hand Sociedad Quimica y Minera (NYSE:SQM) is the least popular one with only 8 bullish hedge fund positions. J.B. Hunt Transport Services, Inc. (NASDAQ:JBHT) is not the least popular stock in this group but hedge fund interest is still below average. This is a slightly negative signal and we’d rather spend our time researching stocks that hedge funds are piling on. Our calculations showed that top 15 most popular stocks among hedge funds returned 19.7% through March 15th and outperformed the S&P 500 ETF (SPY) by 6.6 percentage points. Unfortunately JBHT wasn’t in this group. Hedge funds that bet on JBHT were disappointed as the stock returned 11.2% and underperformed the market. If you are interested in investing in large cap stocks, you should check out the top 15 hedge fund stocks as 13 of these outperformed the market.